a greenhouse in the Antarctic - notice how they painted vegetables on the side of the building! In the last post, we looked at the work of an artist who is creating spaces to grow food in a very difficult place – a cubicle in an office building. 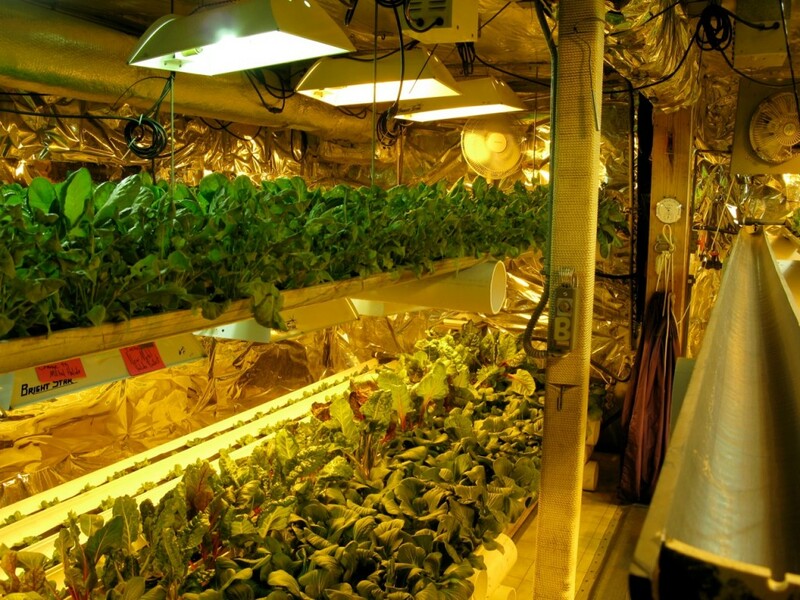 In THIS post, we are taking a trip to possibly the most difficult, inhospitable space to grow food in the entire world – McMurdo Ice Station in ANTARCTICA! You might be asking yourself how your Germinatrix managed to get these super top-secret shots of growing food in this extremely remote, unforgiving place? I will not divulge my sources. Let me just say that I had a clandestine meeting with a young denizen of the ice station, and he regaled me with stories of hydroponic food growing at McMurdo. It was all so Sci-Fi and enthralling! 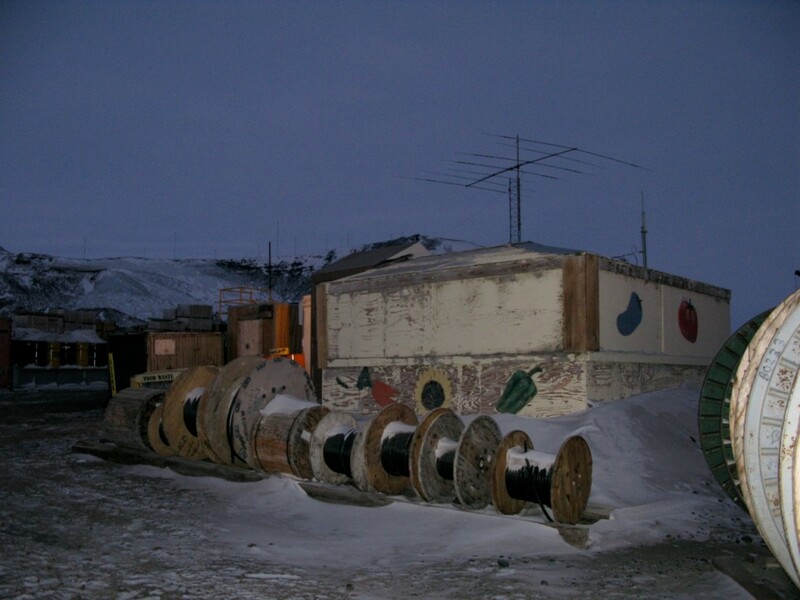 McMurdo Station is a science and support facility that services all of the research going on in Antarctica – everything that has to get to the South Pole station (the remotest place on earth) has to come through McMurdo. There are a little over a 1500 people there during the prime season, but when the skies go dark, the numbers dwindle to a tiny crew of support staff and engineers who keep the station up and running until it the conditions are right for the scientists to return. Science and research is the main aim of the station – it is a remarkable “control”, because there is little pollution, and because it is very very quiet – some of the most interesting discoveries about sound have been made down there, in the silence. Isn’t that FREAKY??? Anyway – the people who live at the station subsist mostly on canned and frozen food. But one day, several years ago (my source whispered this as if it were a legend or a well kept secret), one man decided he needed some fresh tomatoes. 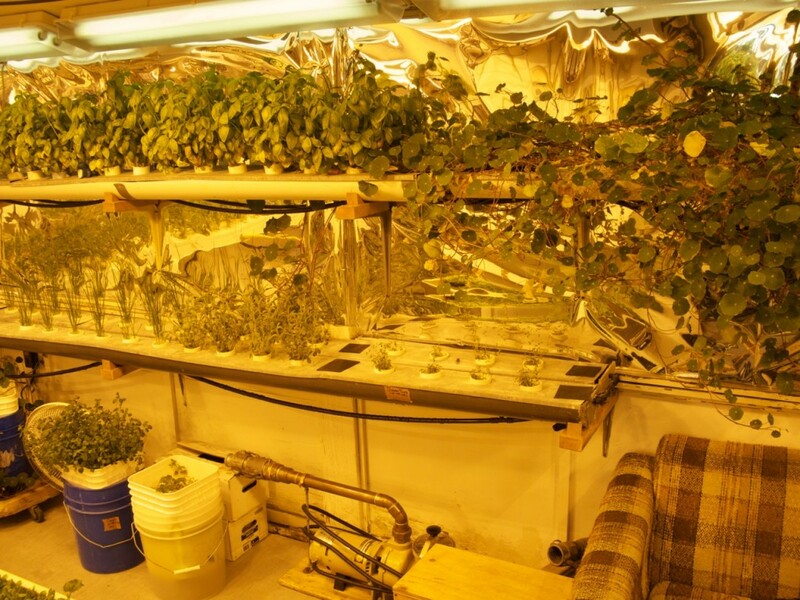 He commandeered a shed and set about building a hydroponic system to allow for the growing of vegetables and herbs and had a pilot bring him seeds. That was the beginnings of fresh food for the station. I asked if there was any other “plant” being grown in the hydroponics in the shed, but my source just raised an eyebrow- I was left to wonder. My source recently returned from his 9 month sojourn way way down there, and he was very serious when he looked into my eyes and said that it is unbelievable the difference fresh herbs made to a meal prepared exclusively of canned or frozen food. I gently patted his hand – I could imagine. He was there at the station doing support work – important maintenance and upkeep of the facilities, but he spent most of his spare time in the growing hut. 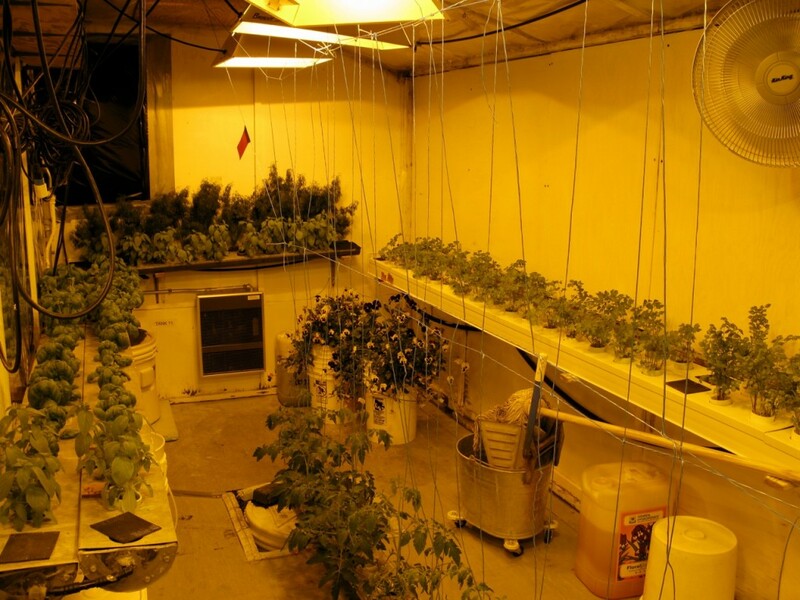 Not only was the act of cultivating fresh food immensely centering in the strange, dark environment where he found himself , but the growlights helped him keep the intense gloom that a lack of sunlight causes at bay. The air in Antarctica is very dry, but in the food chamber there were humidifiers, so it was comfortable – he would read, listen to music, and nap. I had no idea how necessary a growing environment could be down there – it was obviously something more than just a place to grow food. The way my source described it, it was a GARDEN – a place to get away, to enjoy nature, to revel in the magic of what living plants (and the place they grow in) can do for a person. I was dazzled, but not surprised. notice the chair in the corner - for relaxation and contemplation in the "garden"
What WAS surprising was the jerry-rigged nature of the greenhouse. I’d imagined it would be sleek and scientific – but no, of course it wasn’t. It was built by food lovers with things that were cast off from the station, because asking for things to be flown in by plane was often a problem. See, EVERYTHING down there has to be flown in or brought in by boat, and the climate makes these trips infrequent. Most of the cargo is limited to necessary science and building equipment, so the fact that they got humidifiers (obviously from Home Depot or OSH), rockwool (the substrate used for hydroponic growing) and growlights was a luxury. Everything else was gleaned and salvaged from things cast off from the station – old ventilation tubing was used to warm the space, drain pipes were cut in half to be used as containers, reflective thermal insulation sheets – all recycled. 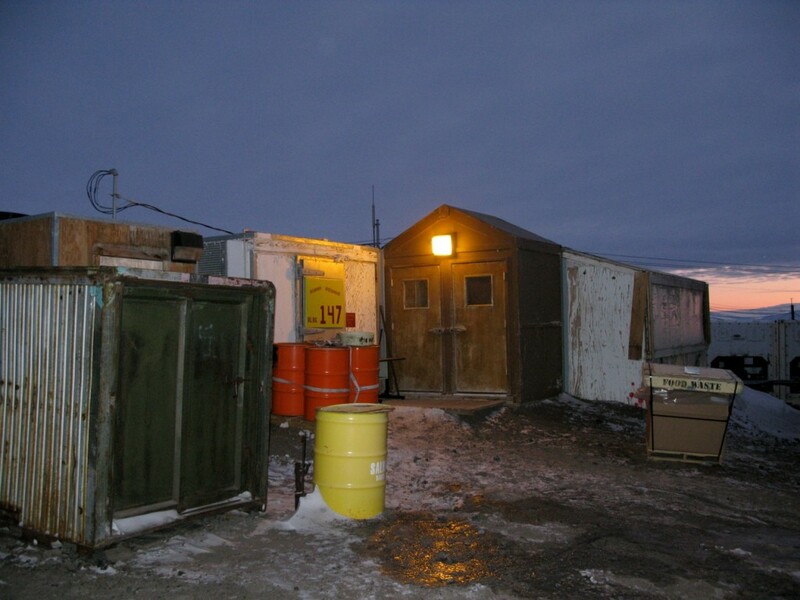 McMurdo HAS to be a sustainable environment – they have no choice. Instead of everything being Sci-Fi in a sleek, space age way, it was a post-apocalyptic “Mad Max” sensibility that was evident. And that made it better. It shows that we can grow food anywhere, under any conditions, without having to erect an expensive greenhouse. We can find and old shed and go from there, finding what we need in what others throw out and making odd, unwanted things work to our purposes. I want to thank my source, who is getting ready for a new adventure, this time on the high seas. I am hoping the next time we meet, he has another story to tell, maybe of seaweed farm in the middle of the Sargasso Sea, or of a tribe of vegetarian mermaids who live near the Galapagos. So there are no excuses – GROW FOOD, wherever you are! My favorite bit is the big white plastic buckets OVERFLOWING with pansies in the last photo! Food for body and soul! I WILL GROW FOOD! I loved this article – awesomeness embodied – and definite inspiration for so many who struggle to eat good food. Keep it coming! We want more! Thank you for this very interesting text, I was really amazed! You’re right about there are no excuses to grow food after what you (and you special source) showed us! The thing that puzzles me is how my husband’s old bachelor-era furniture got to Antarctica. I’d recognize that brown plaid anywhere. In addition to your post I was wondering, What impression is maximizing Antarctic shallow-water temperatures developing on the selection of crabs and why? Wow, this is one cool greenhouse. Never seen one like this before. Really have done a good job there, finally ending the unhealthy canned food eating habits for good. “Sunshine” was one of the best movies I have seen. I never knew about hydroponics before and I was like, “What? You can grow plants in outerspace?”. Now I know that it is possible. No cold winter months or having zero gravity can stop you from growing anything you want.